My mom, back in the United States, is a member of several groups: a knitting group, a weaving group, a retired schoolteacher’s group, etc., etc., etc. For one of these groups, she has been asked to make a presentation about…MOROCCO! She’s never been to Morocco. She was asked because her daughter (that would be me) lives and works in Morocco. That means my mom has been mining my photos about Morocco, mostly from Facebook, where I have nearly two thousand of them. However, of course, these two thousand pictures are not enough. Lately, I have been searching for several specific ones to add. Some of the ones I am looking for? One of the meat market. 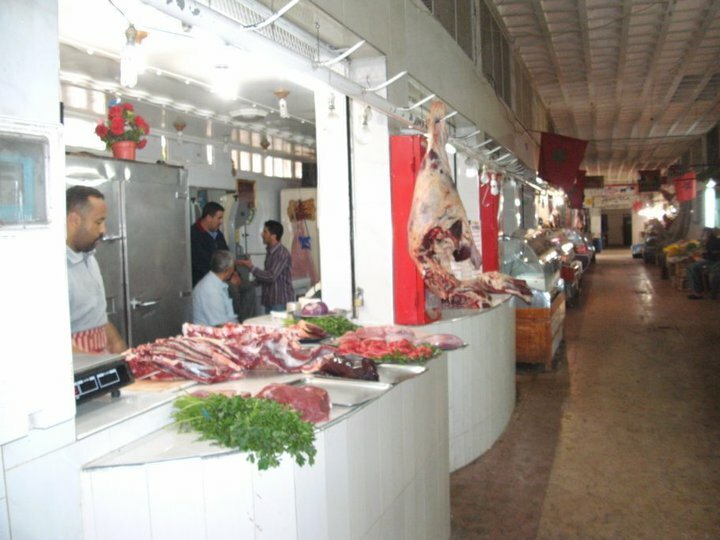 For many Americans newly arrived in Morocco, visiting the meat market for the first time converts them to total vegetarians for the duration of their stay. You must understand American meat purchasing. We go to a hygienic, temperature controlled grocery store where very little is out-of-place, much less dirty. We go to a clean and refrigerated meat counter, and select the cuts of beef, pork, chicken, whatever, from the hygienically plastic-wrapped, neat and clean packages displayed there. No blood – no guts, and absolutely no resemblance to the creature that used to walk around and moo, or bleat, or cluck. There was an airhead in California (of course) who wrote to her newspaper (and the editor actually published it, clearly being a person with a sense of humor) chastising people (hunters) who kill animals for food. She self-righteously admonished the bloody killers that they should go to the supermarket and get their meat, where “no animals were harmed.” I SNIT you not. I was raised in the country, so I know that meat is not made for those little packages from Soylent Green. Every year at the state fair in Georgia, my home state in the US (and a mostly rural state), there is a huge display with live cows being milked: because the city people REALLY don’t know that the milk they buy does not originate in those little cartons. The photo looks cleaner than it was…..really. multiple carcasses: sheep, goal, cow, some with the heads still on (hard to tell a sheep from a goat without it) displaying their male gonads prominently. Male animals are preferred for the table in Morocco for cultural reasons, because I know for a fact that they don’t taste as good as the females: testosterone ruins more than just behavior. Could make you sit down and have to put your head between your knees. Especially if the weather in August is warm (it IS). Something about the smell…….is really good at making vegetarians. 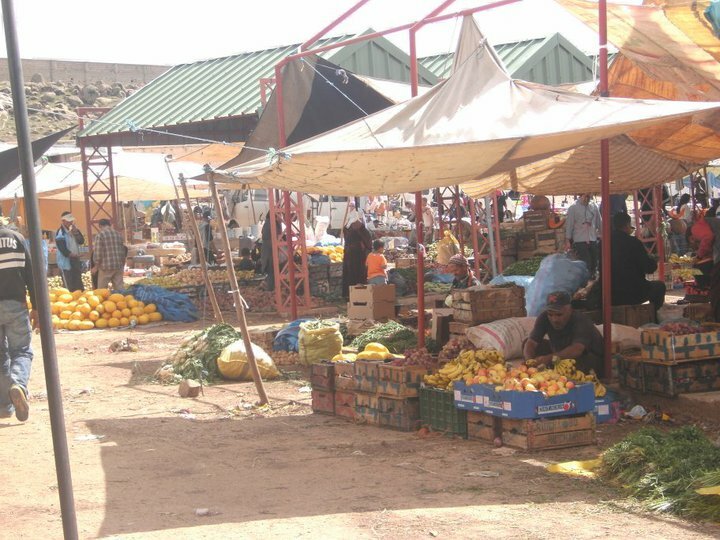 Then, I needed to get a photo of the souk, especially the livestock sales. It actually also shocks Americans to see a full-grown horse loaded into a compact pickup truck. His head overhangs the cab, and his rump sticks out the back – and off we go!! Plus, you can purchase your chicken for Sunday dinner live – or, as we put it: “on the hoof.” Once you have chosen your victim, the processor there will ritually slaughter it for you, let it bleed out, then pluck it with a neat, homemade machine they cobble together from pieces of rubber tires and an old air conditioner fan, and gut it for you while you shop elsewhere, or while you watch (as if). Then, you collect your chicken; still warm, but guaranteed fresh, at least. This causes some Americans problems. We are not used to looking our dinner in the eyes, while it is still walking around. Usually, the produce section is fairly safe. There are mounds and mounds of all sorts of fresh produce piled up for you to choose from, from an unending number of individual vendors. When I know in advance that the newly arrived American is squeamish – and I have learned to ASK – we generally just stay there, where it is safer. I already go the extra pictures of the wedding attire, and the wedding throne. I also got pictures of the hand-made rug shop, too!